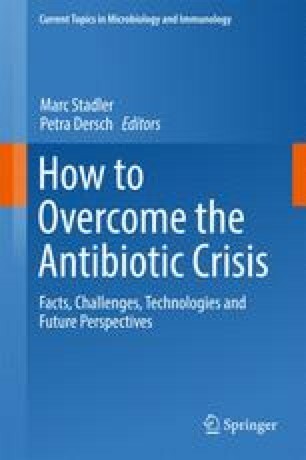 Bacteria have been by far the most promising resource for antibiotics in the past decades and will in all undoubtedly remain an important resource of innovative bioactive natural products in the future. Actinobacteria have been screened for many years, whereas the Myxobacteria have been underestimated in the past. Even though Actinobacteria belong to the Gram-positive and Myxobacteria to the Gram-negative bacteria both groups have a number of similar characters, as they both have huge genomes with in some cases more than 10kB and a high GC content and they both can differentiate and have often cell cycles including the formation of spores. Actinobacteria have been used for the antibiotic research for many years, hence it is often discussed whether this resource has now been exhaustively exploited but most of the screening programs from pharmaceutical companies were basing on the cultivation mainly of members of the genus Streptomyces or Streptomyces like strains (e.g., some Saccharopolyspora, Amycolatopsis or Actinomadura species) by use of standard methods so that many of the so called “neglected” Actinobacteria were overlooked the whole time. The present review gives an overview on the state of the art regarding new bioactive compounds with a focus on the marine habitats. Furthermore, the evaluation of Myxobacteria in our ongoing search for novel anti-infectives is highlighted.